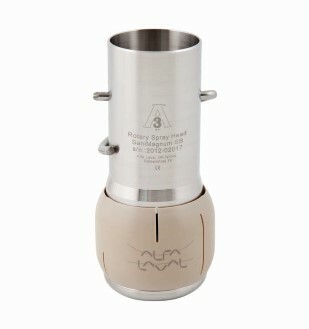 The Alfa Laval Toftejorg SaniMagnum SB Rotary Spray Head is designed with respect to self-cleaning, self-draining and inspectability. Its novel patented one-clip assembly offers easy installation, disassembly and inspection without compromising cleanability and drainability. The SaniMagnum SB is an efficient replacement for the traditional Static Spray Ball as it offers liquid impact on the entire tank wall that lies within the spray pattern – a 270°U or a 360° pattern; both at a lower flow rate at equally low pressure. The device is fully 3-A compliant. Toftejorg rotary spray heads use the cleaning fluid itself to provide coverage and impact. The physical flow of the cleaning media causes the rotary spray head to rotate, with fan jets laying out a swirling pattern across the inner surface of the vessel. These jets provide a combination of physical impact and a variable falling film of cleaning fluid that covers all the internal surfaces of the tank or reactor. The variable falling film has higher heat and mass transfer coefficients than the falling film produced by the static spray ball. The spray head also cleans itself by directing the cleaning media through the rotating bearing track and onto the neck of the elongated head. Rotary spray heads are a cost-effective alternative to traditional static spray balls because they use only small volumes of cleaning fluid at low pressure. These devices are suitable for virtually all kinds of industrial cleaning, including tanks, reactors, vessels and other containers. Designed with minimal internal pressure loss, Toftejorg rotary spray heads rotate at pressures of less than 0.1 bar; however, the recommended operating pressure is between 2 and 3 bar. For over half a century, rotary spray head technology has proven successful in providing reliable and repeatable cleaning performance and a long service life.